More than a wheel brand, bonspeed represents the attitude of the automotive lifestyle. At bonspeed, we design wheels for cars and trucks that win shows and stand out in a crowd! bonspeed Wheels are made in the heart of Southern California, where the beach and the endless miles of black topped streets inspire cool design and American-made quality. The polished luster of every bonspeed Wheel sets the trends that others follow. That is why hot rods, muscle cars, sport trucks, mini trucks, 4x4, pro-touring and exotic car enthusiasts choose our wheels. Before founding bonspeed, Brad Fanshaw established Boyds Wheels/Hot Rods by Boyd as the aftermarket's industry champion through innovation and a successful public offering. Under the direction of Fanshaw, Boyds was one of the industry's most successful company's. During the period of 1991-1996 under Fanshaw's guidance as President/C.O.O., Boyds created some of the most notable trend-setting products and hot rods. The company also grew from a $500,000 (annual sales) hot rod shop to a $35 million publicly held corporation. youth marketing. It was many of these marketing techniques that led Vision from $10 million to $120 million in sales during the five years that he led worldwide marketing, advertising and promotion. Being a world wide phenomenon and a founding member of one of the worlds most famous rock bands is a great attribute to any marketer. 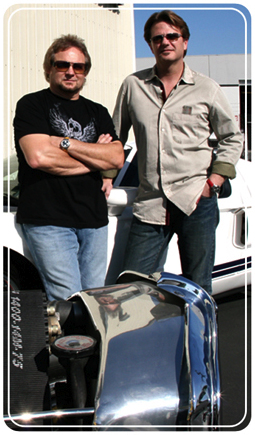 Having the bassist and a founding member of Van Halen as a partner is a marketing bonanza, especially when he is a car fanatic! A long-time friend of Fanshaw, Anthony became a partner after the company was established in 1996. Anthony provides his celebrity endorsement to all of the bonspeed products, but more importantly, he provides a unique marketing perspective. Anthony provides fan feedback about products, trends and fads that he sees worldwide. In his progressive industry of music, he is able to keep in touch with emerging lifestyle attitudes and trends. Anthony brings this first-hand perspective back to the bonspeed team. Michael can currently be seen world-wide, touring with his new band Chickenfoot. More than a wheel brand, bonspeed represents the attitude of the automotive lifestyle. 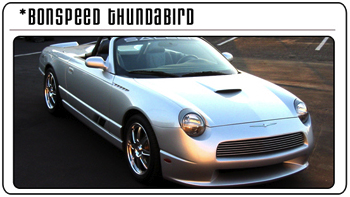 At bonspeed, we design wheels for cars and trucks that win shows and stand out in a crowd! bonspeed Wheels are made in the heart of Southern California where the beach and the endless miles of black topped streets inspire cool design and American-made quality. If you would like to get the whole story behind each one of the bonspeed Design Studio's unique creations then click on the corresponding links.